Choose Us, We can transfer and do all the heavy lifting when switching hosting providers. You need high availability web hosting when it is important that your website should not slow down or stop responding, even if the number of people visiting the website increase suddenly. In Wisconsin such high availability is required for the websites for some of the largest business’s, schools, colleges and boards of education particularly on the day that exam results are declared and thousands of students (along with their friends and well wishers) attempt to access the website at the same time. Though many web hosting companies in Wisconsin claim to offer reliable services, Badger State Web Services uses a custom-configured environment that is purpose built to host even the highest-traffic websites, serving the ninth largest volume of traffic on the entire Internet, hosting more than 400,000 websites that get over 500 billion page views per year. When you subscribe to Badger State Web Services high availability web hosting service, your website gets the benefit of the unique environment which only our partner Rackspace offers. When your website gets a sudden increase in visitors, the resources of the server that your web site uses will be exhausted. In this situation, the Rackspace Cloud Sites environment will automatically and dynamically adjust resources availability to the server and keep your website operating normally. Your site won’t go down or even slow down. 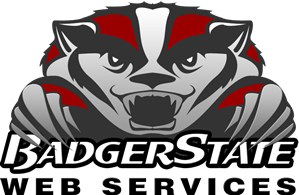 Badger State Web Services guarantees 99% up-time on our high availability web hosting services. Some of Wisconsin’s biggest businesses use Badger State Web Services high availability web hosting services. Start your web hosting with us Today!